Not so long ago, I hated laundry. Hated. It. So much. 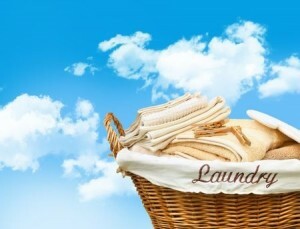 I hated laundry so much, I put a laundry room upstairs in my house so I couldn’t avoid it…but I still did. I’d let it pile up until we were wearing the “B Team” underwear, if you know what I mean. And then I’d moan and groan and complain to myself as I did it. Well, changing a couple of laundry habits made my life a whole lot better and now? I actually don’t hate laundry anymore. This post may offend your sensibilities, if you’re super-green and think we should only run full loads of laundry and dishes. I can’t help that. These laundry habits work for me, and frankly, more often than not, the loads actually do end up being full. So please please, don’t complain about how non-green this process is. Sometimes one has to choose between having a life that works and is slightly less green and having a life that kind of doesn’t work, but is perfectly green. I choose…a life that works. I read an article somewhere that said, “You should do one load of laundry every day.” I couldn’t imagine doing that. Why would I do that? We don’t have enough laundry for that. There are only two of us! Also, I hate laundry. Why would I do something I hate every single day? Gross! But I tried it. The article said I’d be caught up on all my laundry within a week and I’d never fall behind again. Big promises, right? You know what? IT’S TRUE. I haven’t had laundry stack up in weeks. Each morning, as I leave the bedroom, I take all the dirty laundry from the hamper and separate it into whites, colors, and darks. I look at the three piles. Whatever’s fullest, that’s the load I do that day. I toss the laundry into the washer, press “Start,” and I’m downstairs making coffee in moments. It’s genius. One thing I’ve discovered is that if I do laundry and dishes (another topic for another post) first thing in the morning, I go into my day feeling like I’ve already accomplished something before I even started the day. There’s just something about not having anything pressing (ha! laundry joke!) in my housekeeping that I’m dreading. In coming posts, I’ll be sharing other housekeeping tips that keep me sane and make my home reasonably presentable 95% of the time. 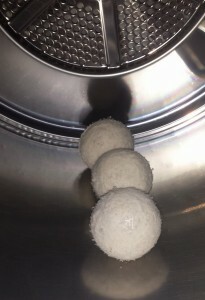 Another thing I did that changed my feelings about laundry was to try a couple of new ways of doing laundry, thanks to a subscription box that sent me soapnuts and woolen dryer balls. I’d never tried such things, but I thought I’d give them a shot. 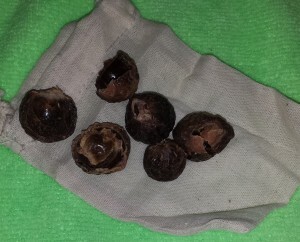 The soapnuts are fantastic. Our clothes get clean, but without harsh chemicals or anything that might harm the environment. Soap nuts. This is how much I use in a bag, and it lasts about 10-12 washes. I hang most of our clothes on a drying rack, but I do toss pajamas and socks and stuff in the dryer. Since we started using the wool dryer balls, we’ve had ZERO static electricity in our dryer-dried clothing. These days, I actually don’t mind doing laundry. It’s a miracle! I didn’t even know it was possible, but it is. But…don’t get in my way if it’s morning and I’m trying to do laundry. Iv’e become slightly obsessive about it, and you don’t want to mess with my routine.